President Vladimir Putin hosted the 16th annual Direct Line call-in show Thursday, taking questions from citizens across the country by phone and video link. 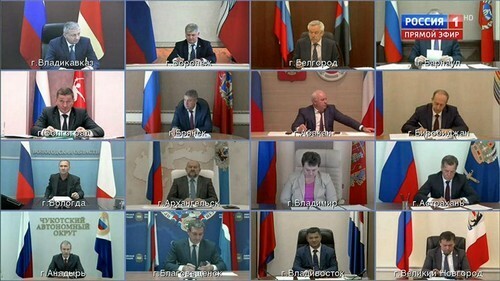 This year, the president’s phone-in, which lasted for 4 hours and 20 minutes, no longer featured a live audience and allowed the president to redirect citizens’ questions to regional authorities. Within hours of the show, Russia’s governors and local officials scrambled to fulfill the president’s orders to fix the problems raised by the individuals chosen to talk to Putin. Here are some of the first initiatives. An unemployed engineer from Komsomolsk-on-Amur, forced to work as a painter, asked Putin for a new job during the live show. The prosecutor’s office immediately launched a review, while the Khabarovsk region governor, Vyacheslav Shport, promised to personally help the man find a fitting job. The father of a large household took his chance to complain to the president about the costs of housing. The governor of Ivanovsk, Stanislav Voskresensky, immediately got in touch with the man’s bank and announced that he had secured a lower rate on their mortgage, bringing it down from 13 to 9.5 percent. The residents of the small town of Strunino in the Vladimir region complained about the closure of certain departments within their local clinic, particularly the childcare department. After listing the many ways in which she was investing in healthcare, the regional governor said she would get on the case and direct funds to the clinic. Some issues were solved by Putin in real time during the show. The Leger family from the village of Staraya Surtayka asked the president to stop their local school from being closed. Putin immediately transferred the question to the governor of the Altai region, Viktor Tomenko, who promptly explained that it was an administrative miscommunication and that the school would in fact stay open. Not everyone, however, received the immediate help they were hoping for. Yevgenia Lavrik of the Stavropol region, who complained of bureaucratic complications after her house was flooded, was left disappointed. She reported that the local official who arrived to her house after the Direct Line had limited himself to answering journalists’ questions outside her home.